[MARCH 5, 2002] Farm Foundation, based in Oak Brook, is one of the collaborating institutions receiving a $2 million grant from the U.S. Department of Agriculture for a national study of university-industry relationships in agricultural biotechnology. The grant is funded from the Initiative for Future Agriculture and Food Systems under USDA’s Cooperative State Research, Education and Extension Service. The three-year project, "Public Goods and University-Industry Relationships in Agricultural Biotechnology," will assess university-industry research, licensing and other partnerships, with special emphasis on the mix of public and private goods provided through agricultural biotechnology. While the project will be headquartered at Portland State University and headed by Project Director Dave Ervin, a professor in Portland State University’s Environmental Sciences and Resources Program, Farm Foundation will have a major role in disseminating project findings to policymakers and private sector decision-makers. "With agricultural biotechnology research being carried out increasingly in the private sector, often in collaboration with university researchers, questions about the relationships between universities and companies to develop agricultural biotechnology products are the subject of much speculation and little scientific information. Farm Foundation is pleased to be involved with one of the first studies to improve our understanding of the relationships, their effects on products and appropriate policies to address any potential issues," according to Walter J. Armbruster, president of Farm Foundation. Farm Foundation’s mission is to improve the economic and social well-being of U.S. agriculture and rural people by helping public and private sector decision-makers identify and understand forces that will shape the future. Agricultural biotechnology has the potential to improve production and human health and reduce pollution. The project investigators will interview university and industry personnel; conduct a survey of university scientists, technology officers and administrators; and undertake socioeconomic analysis to identify problems and potential policies to foster the development of products with traits that promote widespread public benefits. Project findings will inform key stakeholders about the manner in which agricultural biotechnology research is planned, coordinated and rewarded; and stimulate constructive dialogue among academics, commercial firms and policymakers. [MARCH 4, 2002] University of Illinois Extension and the McLean County Farm Bureau are offering nine computer classes to assist farm owners and operators on using today’s computers and software on the farm. The course offerings will be the week of March 11-15 on the ISU campus. All of the classes are offered as half-day sessions, between 9 a.m. and noon and from 1 to 4 p.m., with the option attending the entire day. Preregistration is required, and at least five participants are needed to have each class. The cost of each session is $15. Registration is being handled through the McLean County Extension Office, (309) 663-8306. Instructors include University of Illinois Extension educators and the McLean County Farm Bureau director of programs. Monday, March 11, morning session — Ag Computers 101 — Designed for those thinking of buying or having recently purchased a computer. Introductions to word processing, spreadsheets, and what it takes to get Internet and e-mail. Monday, March 11 afternoon session — Farm Spreadsheets (using Microsoft Excel) — A how-to session with examples of spreadsheets on the farm. Tuesday, March 12, morning — Take a virtual tour of agronomic websites. Tuesday, March 12, afternoon — A virtual tour of agricultural information beyond the university, and hints and helps to search for that information you’ve been looking to find. Wednesday, March 13, morning — Quicken 101. Wednesday, March 13, afternoon — Best Kept Secrets of the FarmDoc.com (ag economics) website. Thursday, March 14, morning — Quicken 102. Thursday, March 14, afternoon — FAST Tools — Financial analysis software from the University of Illinois. Friday, March 15, morning — PC Mars Farm Accounting Software (FBFM-provided instructor). For further information, please contact the McLean County Extension Office, (309) 663-8306. Logan County will host a soil analysis clinic for soybean cyst nematodes on Monday, March 11, from 9 to 11 a.m. at the Extension office. Nematode counts will be done for two soil samples at no charge. Additional samples will be done at $5 each. Soil samples should be taken the same as for soil fertility analysis. For predictive analysis, take soil samples from fields that will be planted to soybeans this year. For determining if you have the pest, take samples that were planted to soybeans last year. For more information, please call the Extension office, 732-8289, or e-mail John Fulton at fultonj@mail.aces.uiuc.edu. Check out the University of Illinois College of ACES open house information on the web at http://www.aces.uiuc.edu/openhouse/. The open house runs this Friday and Saturday at various locations on campus. [FEB. 18, 2002] It’s once again official with the release of county yields for corn and soybeans from the Illinois/U.S. Crop Reporting Service: Logan County producers weathered a year of ups and downs in the weather categories to average a yield of 151 bushels per acre for corn and 47 for soybeans. The top-yielding counties in the state for corn were Moultrie County with 175, Coles County with 174, Douglas and Piatt counties with 170, and McDonough and Bureau counties with 169 bushels per acre. Top-yielding soybean counties were Douglas County with 51 and Coles, Moultrie, Stark and Henderson counties with 50 bushels per acre. The Logan County five-year average yields are 151.6 bushels per acre for corn and 47.5 bushels per acre for soybeans. Logan County record yields for both corn and soybeans were both established in 1994, with 181 bushels per acre for corn and 50.5 bushels per acre for soybeans. McLean County was once again the top producer of corn and soybeans, with production of 50,180,800 bushels of corn and 14,910,700 bushels of soybeans. Logan County produced 27,466,900 bushels of corn and 7,712,700 bushels of soybeans. What’s it cost to farm? [FEB. 4, 2002] There has been a lot of press concerning farmers, farm program payments and the like since last fall. I’m not even going to go there. What interests me right now are the input costs and the income estimates. Just out are the estimated costs of production for this coming growing season, courtesy of Gary Schnitkey at the University of Illinois. With corn and soybeans being our major crops, I’ll concentrate on relaying information on those two. The short version of corn after soybeans is that the cost to produce an acre is $419. This is based on 160-bushel-per-acre yields. The variable costs are $183 per acre. I’ll cover some more specifics about variable and fixed costs a bit later. The short version of soybean production is an estimated $345 to produce 55-bushel-per-acre soybeans. The variable soybean cost is $117 per acre. For the longer version of the story on corn, here goes my attempt. Variable costs were estimated at $183 per acre and included fertilizer, lime, pesticides, seed, drying and storage, machinery repairs, crop insurance, and interest on money borrowed for operating money. Just to highlight a few items, nitrogen fertilizer is estimated at $24 per acre, herbicides at $25 and seed at $38. Fixed costs include labor, building costs, machinery costs, interest on investment, farm insurance, utilities and land cost. These fixed costs totaled $236 per acre for our 160-bushel yield level. Getting it down to the cost per bushel, it costs a total of $2.63 per bushel to produce 160-bushel corn with the cost estimates. For soybeans, it costs the $117 per acre for variable costs and $225 per acre for fixed costs (with the same general categories as for corn). Select cost estimates for soybeans are herbicides at $34, seed at $19 and land costs at $145 per acre. The per-bushel cost to produce soybeans is estimated at $6.28 per bushel. enterprise_cost/2002_crop_budgets.html, or stop by the office and pick up a set. The importance of these figures is that they point out what people in production agriculture already know. It takes outside money to keep things rolling. Figuring the loan rate of $1.95 per bushel for corn and $5.41 per bushel for soybeans, costs of production are 68 cents per bushel more than the corn is worth and 87 cents in the case of soybeans. Sure, these cost of production figures had a small labor charge built in, but $22 per acre for soybeans and $27.50 per acre for corn only go so far. The other thing to keep in mind is that production agriculture is about the only major commodity where the producer does not set the selling price — it is set by the buyers. [FEB. 13, 2002] Recognition and honors were awarded at the annual Logan County Soil and Water Conservation District meeting last Thursday night. Board member Tom Martin was presented a plaque for six years of service to the district. He is retiring from the board of directors. Martin and his family reside on a farm near Mount Pulaski. He has been active in conservation since the 1983. He has used conservation tillage over the years and has made numerous tree plantings and windbreaks, while also maintaining a pond. He has held the offices of chairman and vice chairman for the Logan County SWCD. He has also been active in the Land of Lincoln Soil Savers Club. He served two years as their president and five years on their board of directors. Local FFA chapters were also recognized at the meeting. [FEB. 18, 2002] The Midwest Equipment Dealers Association, through its educational foundation, Midwest Equipment Foundation, will provide two $1,000 scholarships and four $750 scholarships for the 2002-03 school year to students enrolled in association-approved community college training programs. A copy of the scholarship announcement brochure with scholarship rules, application form and listing of approved training programs has been provided to all high school vo-ag instructors and community colleges that provide MEDA-approved training programs. The deadline for scholarship applications is April 1. Scholarship information can also be picked up at Central Illinois Ag’s Atlanta store, 200 Sharon St., 1 (800) 762-2325, or from MEDA directly at 1 (800) 236-6332. 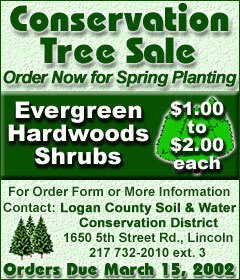 [JAN. 30, 2002] Trees for spring planting are available through the Logan County Soil and Water Conservation District, 1650 Fifth Street Road. Evergreens are sold in bundles of 25 and hardwood is sold in bundles of five, but individual trees may also be purchased. The trees are scheduled to be delivered in April. Click below for an order form to print out, complete and return to the SWCD office with your payment by March 15.